Canon Pixma MG3650 is a great multifunctional printer that offers many advanced features for a home and small office user. The printer boasts wireless connectivity, direct printing, cloud printing, and can print, scan, and copy as well. The all-in-one printing device weighs 5.4kg and measures 449 x 304 x 152mm. It has a flatbed scanner and one large screen display along with a one-touch key control panel. It boasts a 100-sheet paper tray at its front bottom and also has USB ports. The printer uses high-quality Canon Pixma MG 3650 inks and produce impressive images. However, the printing speed of the device is slower than what its competitors offer, in the same price range. 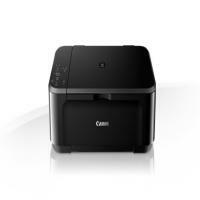 Canon Pixma MG 3650 is a great and feature rich printer for home and small office users. It offers wireless connectivity and lets the users print directly from their phone or tablet. However, the limited paper capacity, slow speed and lack of ADF and fax function might be disappointing for many of the office users. You can also pick Canon Pixma MG 3650 ink multipack (Canon PG540XL/CL54XL1 multipack) to save more on your printing expenses. How to resolve printing issues of Canon Pixma printer? 1. Open the printer properties dialog box. 2. On the [Main] tab, click [High] for the [Print Quality] setting. When you cannot choose the [High] setting or when the print quality does not improve, select [Custom], click [Set] and then adjust the Quality bar for higher print quality. 1. Open the [Print] dialog box. 2. Select [Quality & Media] from the pop-up menu and then click [Detailed Setting]. Print the nozzle check pattern to check for uneven ink output. Make a “Printing Nozzle Check Pattern” for a print test. If the ink supply is uneven, run a “Cartridge Cleaning” process from printer setting. You can also run a deep cleaning process for the ink cartridges. If straight lines are shifted. Check the alignment of the cartridges and run a “Aligning The Ink Cartridge” process from the printer’s cartridge settings. If the print quality does not improve after a standard Canon Pixma MG3650 ink cartridge cleaning, try Cartridge Deep Cleaning, which is a more powerful cleaning process. Cartridge Deep Cleaning consumes more ink than standard Cartridge Cleaning, so perform this procedure only when necessary. 1 Press [Menu] repeatedly until appears. 2 Use [ ] or [ ] to select . 1 Press [Maintenance] repeatedly until appears. 2 Press [Black] or [Color]. Note: Perform the deep Cartridge cleaning only when the normal Cartridge cleaning does not improve the print quality. If Cartridge Deep Cleaning does not improve the print quality, contact a Canon service representative. Q. Why my Canon MG3650 printer prints slowly? A. This printer prints slowly. If it prints with lesser speed than the specified speed, then it can be either due to the presence of any radio wave interference or due to signal status delay or due to large job from another computer. Q. What does support code 1686 indicate when I print from Canon MG3650 printer? A. Support code 1686 indicates that the ink in the cartridge has run out. Replace the ink cartridges with original or compatible Canon Pixma MG3650 ink cartridges. Q. Why colours in document and print out varies after installing compatible Canon Pixma MG3650 ink cartridges? A. Before printing make sure that you are using correct paper size and quality. Colour variation can be due to the clogged nozzle of the printhead, or improper installation of cartridges, or dirty platen. Check for these reasons, even if you face this colour variation problem, you can get your printer service from the authorised service centre. Q. Why there is an inkblot in my every printout? Is it due to the compatible Canon Pixma MG3650 ink cartridges purchased from your store? A. Compatible cartridges purchased from our store does not affect the quality of printouts as they are passed through various testing and follows ISO Standard. When paper quality and paper size doesn’t match with the page specification of the printer then ink blot may occur. Make sure to reduce the intensity of printout before printing. To reduce the intensity of printout, follow the steps start menu> control panel> right click on the printer> select preferences. Preferences tab will open, browse through the main tab and change the intensity manually. Q. Does the Canon Pixma MG3650 printer come with any other features other than printing? A. Yes, Canon Pixma MG3650 printer can print, scan and copy the document. But this printer does not have fax feature and hence they are not preferred for office work. Q. How many pages can Canon Pixma MG3650 ink cartridges print without having to be replaced? A. Original PG540 black ink cartridges and CL541 colour ink cartridges can print up to 180 pages each without having to be replaced. Whereas, compatible PG540XL black ink cartridges can print up to 600 pages and compatible CL541XL colour ink cartridges can print up to 400 pages without the need to be replaced. Q. What is the maximum resolution that Canon Pixma MG3650 printers are capable of producing? A. Canon Pixma MG3650 printers are capable of producing up to a high resolution of 4,800 x 1,200 dpi. Q. How do I install drivers for this printer on my computer? A. If you are a Windows user, you can use the CD-ROM that was provided to you with the printer. If you are a Mac user or have misplaced the CD-ROM, you can download the driver from http://canon.com/ijsetup. Q. I have spare ink cartridges for my old Canon Pixma MX515 which I no longer use. I was wondering if I could use these ink cartridges with my Canon Pixma MG3650? A. Canon Pixma MG3650 ink cartridges are the same as those used in Canon Pixma MX515. You can use the old cartridges with your MG3650 without any hassle. Q. How do I directly print images from my Android phone? A. You will need to download Canon PRINT Inkjet/SELPHY to directly print photos with your Canon Pixma MG3650 printer. You will find the application on Play Store and App Store(Apple devices). Just make sure your phone is connected to the same network as your printer. Q. Will I have to compromise on quality using your compatible Canon Pixma MG3650 ink cartridges instead of original ones? A. Absolutely not! All our compatible ink cartridges are of high quality that have been FSC tested and certified. They will produce the same quality of output as original Canon Pixma MG3650 ink cartridges. Q. Is it possible for me to use other functions when an 'out of ink’ error message is displayed on the LCD screen? A. While to perform other functions, it is necessary for you to first clear the error message by pressing and holding the machine’s [Resume/Cancel] button for at least 5 seconds. This setting may vary depending on your model number, so please refer to your product user manual for detailed instructions. Once the error message gets cleared, other functions like scanning can be performed. Please be aware that if printing of a document is attempted after clearing the error, the quality of prints cannot be guaranteed. Having cleared the error message, the remaining ink level will be unknown and damage may occur within the printhead if the ink runs dry. We recommend for replacing the Canon Pixma MG3650 ink cartridges as soon as possible to avoid this from happening. Q. I am not able to find my machine on Check Printer Settings screen. What should i do now? A. If the machine is not found on the Check Printer Settings screen during the network communication setup, check your network settings first and try again. If you cannot detect the machine during the wireless LAN setup, refer the online user manual available for reference. Important: In case the machine is not detected while you are trying to set up the network communication using a USB cable then, the machine may be in the access point mode. In such case, finish the access point mode and enable the wireless LAN, try to redetect the machine. You can also follow the detailed procedure given in the user manual for reference. Q. What should i do in case no ink comes out of my printer? Printing the nozzle check pattern determines whether the ink ejects properly from the print head nozzles or not. For more details on printing the nozzle check pattern, print head cleaning, and print head deep cleaning, see the user manual available with your printer. Q. Is it possible to purchase the cartridges singly without buying a multipack? A. Yes you can purchase the cartridges in any quantity you choose. The cartridges for this printer are the PG540 & CL541 which are also available in XL. A. Yes we offer a next day delivery service through Fast-way courier service. A. The XL cartridge has a larger ink capacity, and therefore allows you more printing from the same cartridge. Q. Is there any replacement available that can be used instead of the PG-540 and CL-541? Please ensure that your printer is compatible with these cartridges before ordering them. Q. What is the shelf life of these compatible Canon PG-540 and CL-541 ink cartridges? A. If stored correctly in cool and dry place these compatible PG-540 and CL-541 ink cartridges will have a shelf life of about 12 months from the date of purchase. Q. Hey, these Canon Pixma MG3650 ink cartridges are standard or high capacity cartridges? A. There are both type of cartridges available for Canon Pixma MG3650 ink cartridges on this page. The cartridge code appended with the letters "XL" are high capacity ink cartridges which have higher page yield capacity and the cartridge code without “XL” are standard cartridges. Q. Is your multipack consists of separate cartridge for each colour or cyan, magenta and yellow inks in one cartridge? A. The compatible Canon multipack contains two cartridges, the PG-540XL high capacity black ink cartridge and the CL-541 tri-colour ink cartridge. The Cl-541 tri-colour ink cartridge consists of three colours Yellow, Cyan and Magenta inks in single tank. Q. Are these Canon PG540 and CL541 ink cartridges refilled or recycled? A. We have both refilled / recycled and original / genuine Canon Pixma MG3650 ink cartridges on our website. Q. Hey, I don’t need colour prints from my printer, can I only use black cartridge in both the slots available in my Canon Pixma MG3650 printer? A. Your printer will require you to install one black ink cartridge and one tri-colour cartridge in the specified slots for the machine to work, regardless of your need on black and white or colour prints. Q. I am planning to buy new Canon PG-540 ink cartridges and printhead for the same. Is it possible that I can get the cartridges with the printhead attached with them? A. Yes, The Canon FINE technology integrates the cartridge ink tank with the printhead into one cartridge for easy replacement and faster print speed. So, your original Canon PG-540 ink cartridge is already integrated with the printhead. Q. I have Canon Pixma MX395 printer which uses PG540XL and CL541XL ink cartridges and now I need to replace my printer, but I still have a lot of PG540XL and CL541XL ink cartridges available. Can you please suggest me the printer models available which can use these cartridges? A. Yes, I can assure that these Canon Pixma MG3650 ink cartridges will work perfectly fine with your Canon Pixma MG-3600 printer model. Q. Hey, can I use Canon Pixma 541-XL cartridge in my Canon Printer MG4250 model? A. Yes, you can use Canon Pixma 541-XL cartridge in your Canon MG4250 printer model. The Canon 540-XL is high capacity black ink cartridge and Canon 541-XL is a tri-colour ink cartridge.